Description Measure waveform dissimilarity between nearby traces to highlight discontinuities from faults and other stratigraphic changes. Incoherence provides a measure of dissimilarity between nearby traces. It highlights the change from trace to trace, emphasising discontinuities, e.g. from faults and other stratigraphic changes. At each sample, it calculates the difference between the the most similar neighbouring trace, taking into account the local dip and direction. Identical traces return a value of zero, while a value of one indicates maximum dissimilarity. At each sample, a measure of vector distance is calculated independently in different directions, for a range of dips, within a user-defined time-window. For a 3D volume, the algorithm is applied independently in the IL and CL directions. The direction that minimises the vector distance is taken as the apparent dip direction, and the final incoherence value is calculated based on the vector distance between the relevant trace sections. A value of zero represents trace segments with identical values in the dip direction, while a value of one represents complete dissimilarity. Because the operation incorporates a local dip calculation in its results, there is limited benefit to calculating incoherence on a flattened volume. Ensure that the maximum dip parameter is large enough to include any steeply dipping structures and faults. As with any other volumes, incoherence volumes can be viewed in a flattened domain. 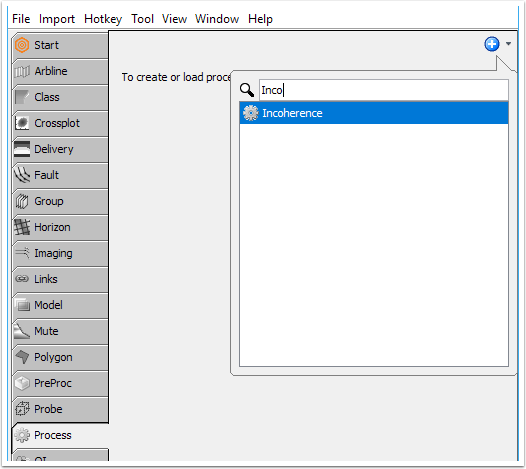 Click the Add icon, select New Process, and double-click Incoherence. Select the 2D or 3D seismic volume for which you want to calculate incoherence. For Output Statistic, select Minimum, Maximum, or Average to determine whether the smallest, biggest, or average value (vector distance between the relevant trace sections) is used in the final calculation of incoherence for a 3D seismic volume. The calculation is performed in both Inline and Crossline directions. Note: This field is not visible if a 2D volume is selected. At Maximum Dip (ms/m) or (m/m), enter the maximum dip of reflection events that Insight needs to allow. For example, an event with a dip of 4ms/m or greater will not be recognised as a "coherent" event with a Maximum Dip parameter of 3ms/m. In this case, the event will appear as having high incoherency along its length. Note: The smaller the window, the longer the process will take, as more iterations are made. 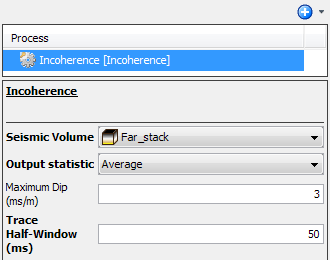 It may be useful to display the "Incoherence" volume with the seismic volume it represents. To do this, you can group the "Incoherence" volume and the seismic volume to display them collectively (see Creating a Group).